So is anything going on right now . . . . is the market setting up for some move to come? Let’s take a look at the broad NASDAQ Composite Index. In the first 5 days of 2014 I see minor price moves and fairly narrow bars, but I note that volume (blue circled area below) is slightly above the 20 day average. So we see activity (in the volume; “effort”) but not much movement (“ease” of prices). I think of this as a neutral stand-off. In Wyckoff terms this may be a warning sign of early Distribution, where supply is coming into the markets and is being absorbed by Demand. That won’t be confirmed until we see a Distribution Bar later. What might be happening though is less ominous. We could be seeing sector rotation, where managers are rotating out of stocks they don’t like and into ones they feel will be moving in 2014. Right now, that appears to be the case. Let’s take a look at the stocks in the S&P 1500 index below. 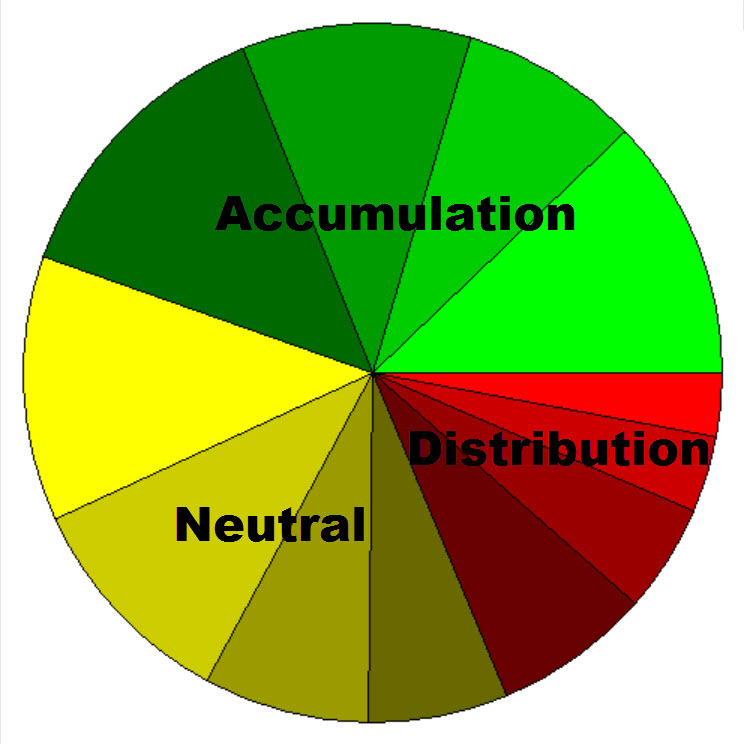 The pie chart above shows the number of stocks in the S&P 1500 that are in Accumulation (buying), Distribution (selling) or Neutral. Think of it as “Money Flow” in and out of the market. Doesn’t look like there is wholesale selling, at least not yet; not much red up there. The chart below shows the number of stocks in the S&P 1500 that are in the upper end of their 20 day price envelope (green), middle (yellow) and lower (red). Think of it as “Price Strength”. Again, this doesn’t show me that the “big guys” are exiting. If it did I’d expect to see more price weakness. Not now, perhaps it will unfold later. My conclusion is that there is activity (above average, but not excessive), and not much money is being withdrawn. So look for sectors and stocks that are getting weaker, but also ones that are getting stronger. Looks like portfolio managers are rearranging there holdings for 2014 and this process could take most of January to complete. I note that my monthly newsletter for January is under the Newsletter tab above. Have a good week. …………… Tom ……………. chart by MetaStock; pie charts by www.highgrowthstock.com; used with permission. Click on graphics to enlarge.